OpenQbo is a Linux distro for robots based on Ubuntu which exclusively includes software and applications directed towards robotics. The goal is to create a Ubuntu based distro which can be used in many current and future robotic platforms. Creators of the distro also hopes to accelerate development of robotics itself in the process. 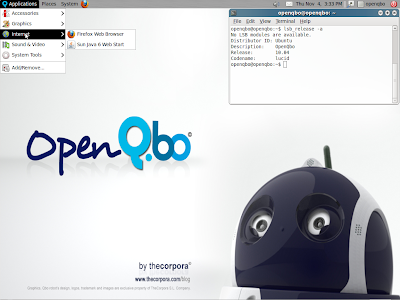 OpenQbo is in many ways similar to Ubuntu Studio. Both are Ubuntu derivatives attuned to do specific tasks and are targeted at specific groups of people. Another interesting example is the Ubuntu Satanic edition. The original idea was to create a lightweight Ubuntu based distro without all the unnecessary services and applications in order to optimize starting time to the maximum and allow its installation on both hard disks and memory cards easy. Default applications in the OpenQbo Robotic distro include Gnome, Festival speech synthesis engine, Julius speech recognition engine, ROS as meta-operating system and so on. You can see the full list of applications available with OpenQbo Robotic distro here. OpenQbo’s size is nearly 1Gb and around the 65% is taken by ROS and Qbo’s voice.